Millions of pounds worth of public sector contracts are awarded every year. The Government have encouraged social enterprises to bid for them. And if that is what you think, you’re wrong. Many social enterprises are already delivering public sector contracts which they bid for in a competitive open tender process. They’re delivering a service well, creating social value, earning income and being paid on time (yes, within statutory 30 day payment terms). And they must have started somewhere. They responded to invitations to tender. Let’s face it, you are never going to win a public sector contract if you don’t bid for it. So if you hear that ACME-corporation is doing something you know you could be doing better…well, it probably sticks in the craw. But if you didn’t bid– that’s your problem. And if you did submit a bid without planning it properly or giving it the time and effort it deserved – I’m afraid that’s also your problem. I believe that values-driven business is changing the world. That exemplary social enterprises which earn their income, deliver outstanding services, and create social impact and value, can and should secure contracts. But I know, from being on both sides of the procurement and commissioning divide, how many social entrepreneurs struggle with bidding. Or simply avoid it altogether. That’s why I’ve written this guide. It’s time for social entrepreneurs to grasp the mettle. If you want to grow your social enterprise by delivering appropriate public sector contracts, it will help you. And that is a promise (which I’ll tell you more about below). 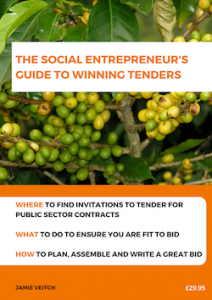 So whether you’re new to bidding OR an experienced bidder but want to do better, The Social Entrepreneur’s Guide to Winning Tenders addresses the biggest challenges to planning and writing great bids. win or lose, learn from the process. I have written successful bids as a social entrepreneur, consultant, business owner, volunteer and board member. I have written bids which did not succeed too, and learned a great deal from the process. I’ve also been on the other side of the fence, running the procurement process for contracts. This toolkit draws on my experience and also on the expertise of a variety of social entrepreneurs and knowledgeable specialists. • “Before I read Jamie Veitch’s guide for winning tenders, I had avoided engaging in the public sector procurement process. It was clouded in mystery and felt scary and overwhelming. But Jamie’s guide has taken the mystery out, and given me the confidence I need to get started. It has provided a dose of reality as to the level of work required to respond to a request for tender, but has given a straightforward, easy to understand process from start to finish so that I now know I can go for the next appropriate opportunity I see.” Elizabeth Shassere, Founder and CEO, Textocracy. • “Should be required reading for all social entrepreneurs.” Adrian Ashton. • “Many thanks for exciting parcel that arrived yesterday. I’m very impressed by the winning tenders Guide. Can I buy 10 copies so we can give them to some of the small organisations we are working with that are hoping to break into tendering.” Kate Welch, Founder and CEO, Social Enterprise Acumen CIC. Get hold of your copy today! How much is a public sector contract worth to you? £5000? £10,000? £50,000? More? And how much is your time worth? If you invest time in putting together a great bid and win a contract, it’s well worthwhile. But if you spend time on a poorly planned and assembled bid, you’ve wasted it. The Social Entrepreneur’s Guide to Winning Tenders is priced at just £29.95 per copy but only £15.00 per copy until midnight on Social Enterprise Day, 15 NOVEMBER. But if you follow its advice it should be worth a multiple of what you pay for it. Bulk orders have proven popular with some organisations buying multiple copies to distribute to social enterprises they support: £95 for 5 copies, £145 for 10 copies, and £195 for 20 copies. You can order your copy using the form below to pay securely by debit or credit card through PayPal (you don’t need to have a PayPal account). I’ll post your copy of the Guide, normally within 24 hours of your order (usually the same day you order). If you’d prefer to receive an invoice and pay by BACS please email me. If you don’t learn something new, of value, which you can implement to support your social enterprise from The Social Entrepreneur’s Guide to Winning Tenders, email me for an unconditional refund. If you’d prefer to receive an invoice and pay by BACS please email me and I’ll sort this out for you. Please contact me with any questions, bulk order requests or if you’d like to discuss a workshop about fitness to bid or writing tenders.